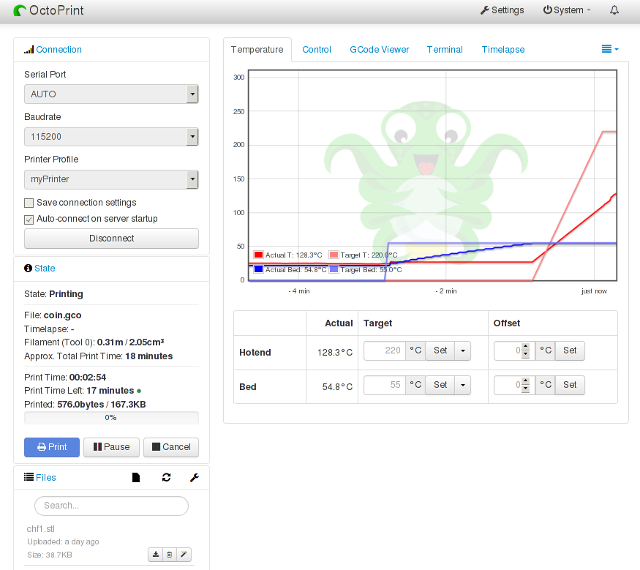 Octoprint from https://octoprint.org/ is an open source version to control 3d printers from the web. OctoPi is a SDcard image (less than 2GByte) for Raspberry (Raspberry Pi A, B, A+, B+, B2, 3 and Zero) is available so installation a test it gets quickly. It uses the debian based raspian and has the default username is “pi”, default password is “raspberry”. sudo raspi-config configures it. sudo su changes to the root console and after this entering sudo is no more required. Your SDcard might be bigger than the image. Once installed, the image can be expanded by sudo raspi-config to use the complete SDcard. Alternatively for people that like it complicated, the image could be made larger to have the same size of the SDcard using the truncate command. dd bs=4M if=2017-06-21-octopi-jessie-lite-0.14.0.img of=/dev/sdf or similar is a command and the only one to be made to put the image to a SDcard. If the network works ssh pi@<IP address as 192.168.1.7> with password "raspberry" can be used to login. Otherwise a HDMI screen and a USB keyboard need to be plugged in. wpa-psk "<my pre shared key aka password>"
Once octoprint is accessed using its ip address in the browser, a printer profile should be added and set as default containing the printer settings. If auto connect to the printer fails, the appropriate port /dev/ttyUSB0 for the raspberry and the correct baudrate as 115200 should be set. Linux generally struggles with higher baud rates since those are out of the specs for physical com ports. Automatic shot down, so when printing is finished the the raspi turns itself off in a saver way than just remove it power. Display progress makes that the octoprint progress appears on the 3d printers display so it is the same as if the 3d printer prints from its SDcard. 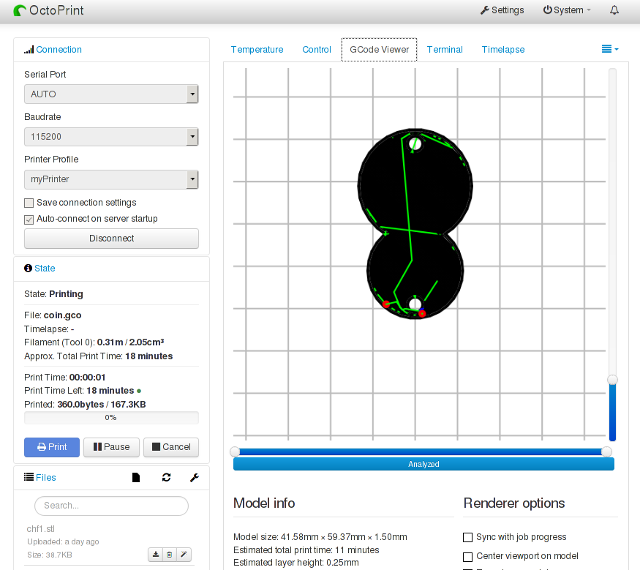 Octoprint supports also slicing stl files into gcodes. However since slicing is one of the most important tasks in 3d printing an external slicer as slic3r that allows to observe the slicing results is recommended. 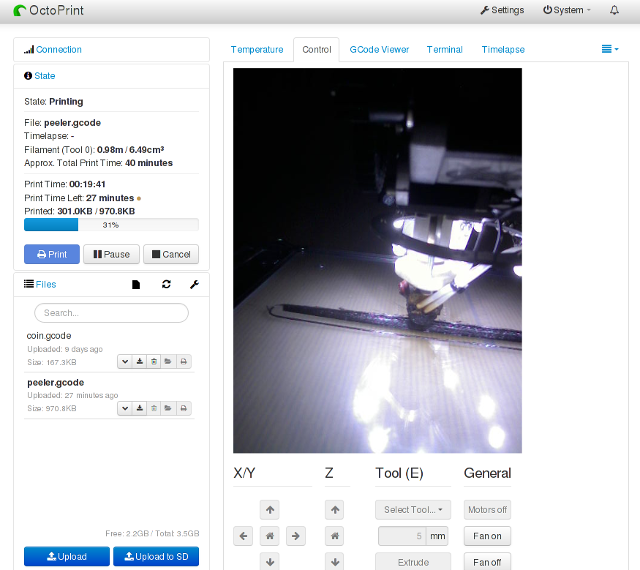 Gcode files can be uploaded but can not be directly rendered and printed. To print one of the file needs to be loaded and then it can also be graphically observed. 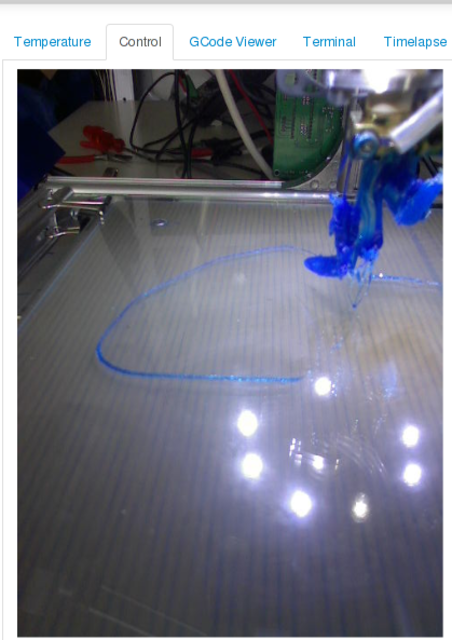 The slicer sclic3r allows directly uploading gcode files to octoprint. OctoPi detects an webcam and shows its streamed video in the control tab. More important than to see how nice it looks is is to observe a disaster and stop printing.